Kielder Water & Forest Park's unique outdoor arts programme is set to continue evolving and become increasingly inclusive, thanks to a new project supported by funding from Arts Council England' (ACE) Project Grants programme. A £49,700 grant will see new artistic works complemented by a range of community outreach projects that will open up the Park's Art & Architecture programme to an even wider audience. The programme's popular curator-led tours will be targeted to specific groups, through work with organisations such as Calvert Trust Kielder, to enable disabled guests and their families to experience the area's art. Work will also be carried out, aimed at building and enhancing relationships with people from black and minority ethnic (BAME) communities, as well as with refugees and asylum seekers. 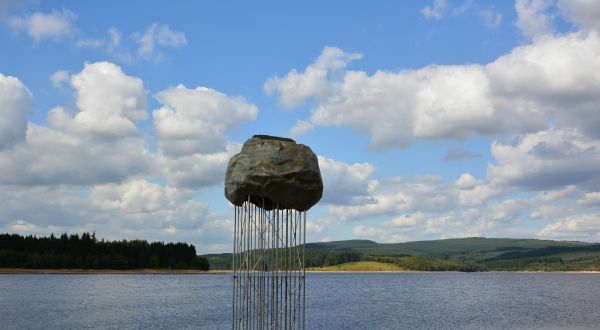 Tethered Cloud, a new installation at Kielder Waterside by architects Messer, Glover and Grindley, will take the form of a reflective ‘cloud' that hovers in the air and changes its appearance as the weather, time of day and seasons change. Work will take place to progress the redevelopment of Forestry Commission's Kielder Castle, to increase its appeal to cyclists and outdoor enthusiasts. Refurbishment work on the award-winning Kielder Belvedere, the programme's first installation, will ensure it remains an attractive draw for visitors. Lynn Turner, Director of the Kielder Water & Forest Park Development Trust, said: "The Kielder Art & Architecture programme is a unique and increasingly strong draw for visitors to the Park, making it a wonderful place to visit and ensuring there is always something new to experience here. The funding from Arts Council England will help us to develop creative projects that support our partner organisations' work in the area, enhancing the visitor experience. "We want to expand the numbers and diversity of visitors to the Park and the exciting projects being developed as a result of this funding range from multi-media activity to direct engagement with people who may not have previously experienced anything like what we have here. "With further funding being applied for to develop other projects, this is a very exciting time for everyone involved with Kielder Water & Forest Park." Jane Tarr, Director North, Arts Council England said "Kielder Water and Forest Park has a unique outdoor cultural programme which enables its many visitors to experience contemporary art in such a unique and unexpected place. This new programme will help a more diverse range of audiences from the community to also enjoy the artistic experiences offered by the Park and I look forward to seeing some of the new work."